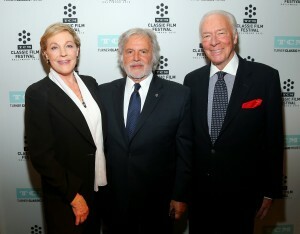 (L-R) Actress Julie Andrews, First Vice President of the Academy of Motion Picture Arts and Sciences Sid Ganis and actor Christopher Plummer attend the Opening Night Gala and screening of The Sound of Music during the 2015 TCM Classic Film Festival on March 26, 2015 in Los Angeles, California. ©Mark Davis/WireImage. 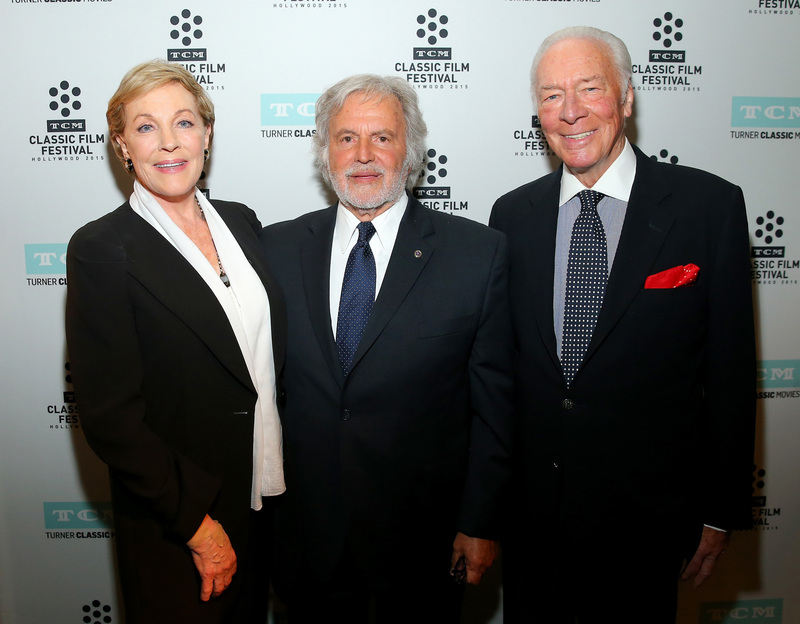 HOLLYWOOD—It was a cornucopia of legendary celebrities and rising stars on the red carpet Thursday, March 26, at the opening night of the TCM Classic Film Festival, beginning this year with a special presentation of the Academy Award winning “The Sound of Music” at the historic TCL Chinese Theatre. Although a half-century has passed since their performance as the offspring of an Austrian captain, who meets and falls in love their music-loving governess, a would-be nun just before World War II, Menzies-Urich, Karath and the other actresses from the film attending the gala event were still fondly referred to as “the children” on the carpet. The Opening Night Gala drew other actors, filmmakers and industry experts who are part of the four-day classic film festival here in the heart of Hollywood. Christine Ebersole, who stars on TBS’ “Sullivan & Son” strolled the red carpet as did Keith Carradine (slated to speak about his father’s film “The Man Who Shot Liberty Valance”), noted Hollywood editor Anne V. Coates, on hand to share two films she edited: “Lawrence of Arabia” and “Out of Sight,” as well as Peter Fonda, who despite warnings from publicists that he was going to be “late” to enter the theater, stopped to speak to the press from around the world about the festival’s showing of “My Darling Clementine,” which stars his father, the late great Henry Fonda. Four members from the cast of the movie “Grease,” were on hand (Barry Pearl, Jamie Donnelly, Michael Tucci and Kelly Ward), looking like no time had passed since they starred as high schoolers in the 1978 musical. And the stars of Turner shows including Lindsay Booth from “The Librarians,” Michael Paul Chan from “Major Crimes” and Colin Cunningham from “Falling Skies” were also happy to have an opportunity to be sharing the limelight with seasoned movie stars. Ebersole, looking lovely in white, recalled seeing “The Sound of Music” the first time as a 10-year-old with her neighbors, traveling from their suburban Chicago home to the Windy City. Naomi Grossman, who plays Pepper on FX’s “American Horror Story,” revealed that she is a big “Sound of Music” fan. Then she broke into the first few lines of “So Long, Farewell,” and didn’t rule out that her “AHS” character may do some singing in the future. “When he gets his hands and footprints in cement tomorrow (in front of the Chinese Theatre), he’s going to deserve it,” said Galligan, who is slated to introduce one of his early films, 1984’s “Nothing Lasts Forever,” at the festival. As the star of the classic fantasy adventure “Gremlins,” and its sequel, “Gremlins 2,” Galligan revealed that he still gets recognized for his role in that nearly every day. Jonathan Del Arco, who plays Dr. Morales on the TNT drama series “Major Crimes,” said he was honored to be walking the red carpet with “The Sound of Music” cast. Many of the actors walking the red carpet considered themselves fans of the classic film. Her favorite scene from the musical? “The Lonely Goatherd,” she said. “It always cracks me up,” the redhead recalled. 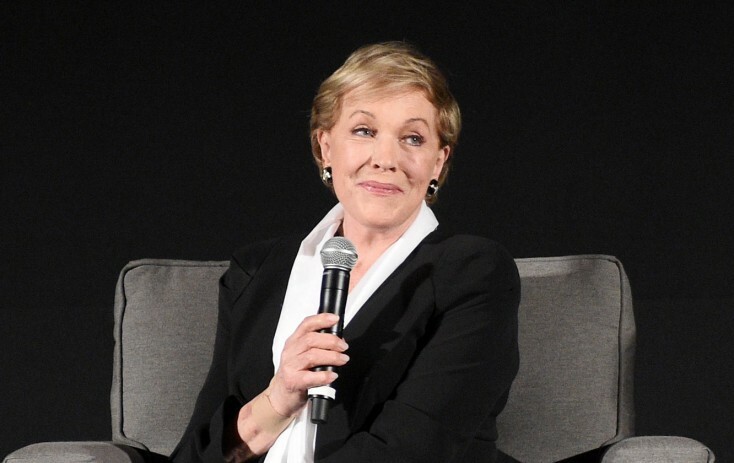 “I always thought it was so fun and so weird and so wonderful,” she said, before being whisked away into the theater, where the audience was treated to a Q&A with “The Sound of Music” stars, hosted by TCM’s Ben Mankiewicz.